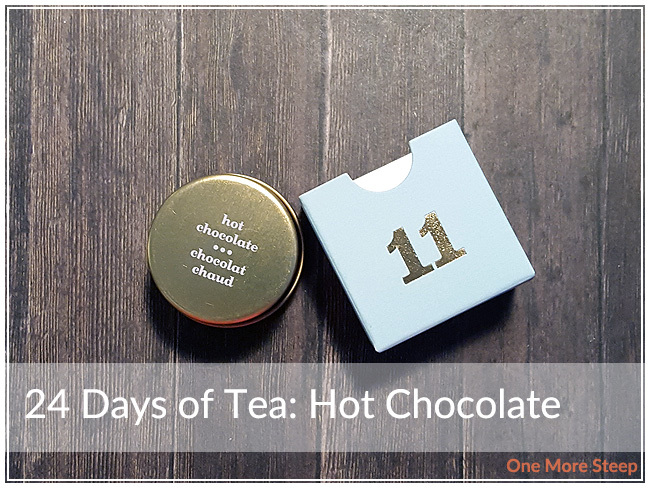 It’s day 11 of the 24 Days of Tea advent calendar and I was a little bit disappointed to pull out the drawer to see Hot Chocolate. Hot Chocolate and I have a bit of a history in that it had let me down. 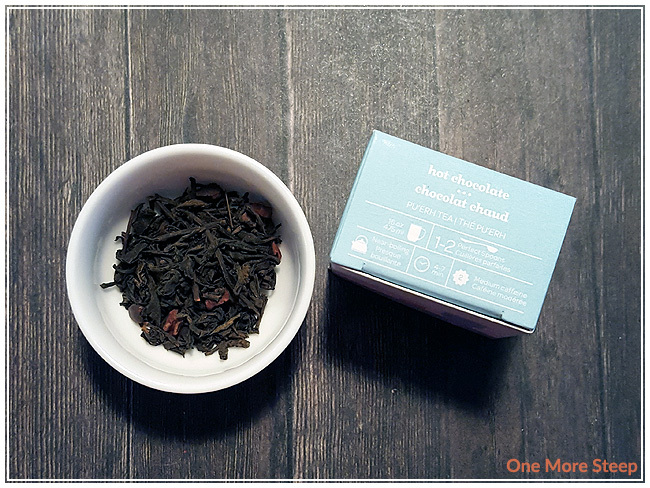 I posted my first review of Hot Chocolate in November 2015. I had high hopes for this tea then, and I still kind of do because of the name. Hot chocolate to me should be creamy and rich with chocolate flavour. The ingredients in Hot Chocolate are: pu’erh tea, black tea, cocoa nibs, chocolate chips, chocolate curls, chocolate liquor, whey powder, lactose, soy lecithin, stevia extract, natural and artificial flavouring. DavidsTea recommends steeping Hot Chocolate in near-boiling (90-95°C/194-203°F) water for 4 to 7 minutes. I had to steep close to 6 minutes to fully melt all of the chocolate. Hot Chocolate steeps to a deep brown colour, there’s oil on the top of the cup. That is one of the issues with having chocolate in your tea (or sprinkles), is that it’s made up of oils so when it melts, you wind up with an oil slick on top of your tea. Not necessarily the most appetizing. It smells a bit like chocolate, but the taste itself isn’t helping the tea at all. 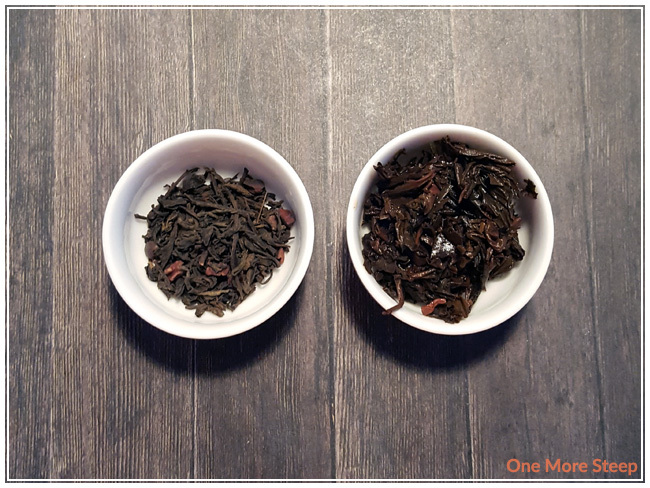 There’s that dank earthiness from the pu-erh base, and then the watered down chocolate flavour from the chocolate shavings. Of course, when you take water and melt it in hot water, you’re going to wind up with watered down chocolate. There’s that harsh sweetness from the artificial sweetener, which I don’t like because it doesn’t add anything positive to this tea for me. I wound up adding a lot of milk to the tea and then finishing off the cup. The milk helps cut the sweetness, and make it more palatable. Hot Chocolate doesn’t do well when resteeped. The chocolate flavour is further diluted (there’s no more chocolate to melt!) and it doesn’t make for a very good cup of tea when you try one more steep. I didn’t like DavidsTea’s Hot Chocolate. With my second critical eye on this tea, I just find that it’s not very good. 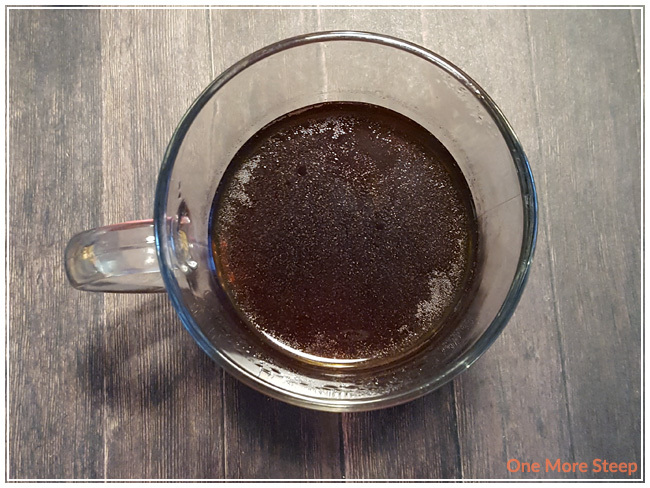 It needs a stronger chocolate flavour in order to make it remind me more of a hot chocolate, and it’s lacking a much needed creaminess to the tea itself that’s needed to better evoke the taste of a much beloved beverage.